What does the Baby Teething Joy kit consist of? After research and thoughtful consideration, we know that babies are drawn to noise, color and taste. We only worked with companies that have over 10 years of experience in producing baby items that are safe, durable and innovative. Why spend so much money on individual items instead, devote in a kit that has all you need for your growing baby. 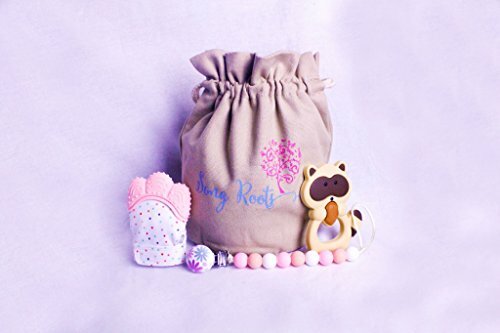 This Teething Joy Kit offers each baby ONE Teething mitten (can be worn either hand), ONE Cute Raccoon teething toy and ONE Pacifier clip with silicone teething beads. Included also is a travel easy bag where you can store the items safely and conveniently. How efficient is that? This is a great and affordable baby shower gift, whether you are a new mother or wanting to spread the joy of motherhood. Buy this gift today and spread the JOY. What is the benefit of each item? The Teething mitten (Blue or Pink package) is the greatest thing you can gift your baby. It is made of BPA FREE FOOD GRADE SILICONE and has multiple silicone teething surfaces to soothe the baby’s sore gums. 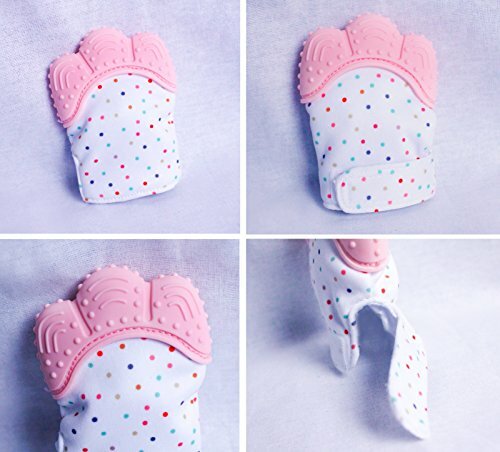 When the mitten is touched, it makes a crinkling sound to engage the baby. The teething mitten has an adjustable Velcro strap to prevent baby from dropping it on the ground and soft breathable fabric that absorbs drool so you spend less money and time doing laundry. 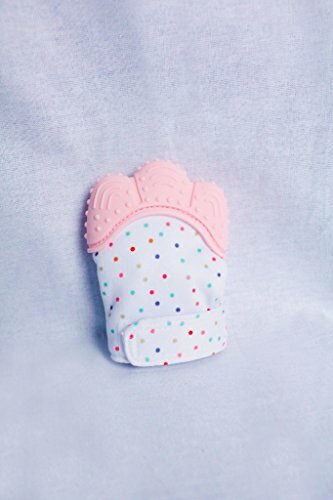 The mitts are machine washable, super easy to clean, so it’s super convenient for the busy parents. 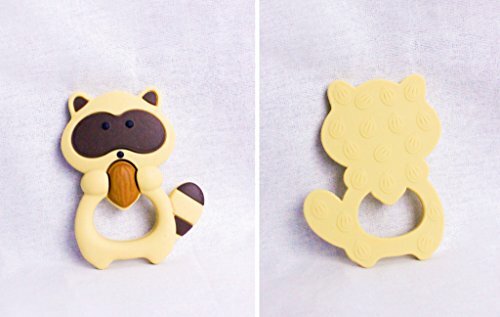 Racoon Teether Toy It is 100% BPA FREE, approved by FDA. It’s big enough for baby’s hand to grip and handle which helps stimulate hand to mouth coordination. The colors are bright with high contrast of lights and darks, which helps stimulates baby’s visual. It’s durable, non-choking design and is washable with soap and or water. It’s a go to teether that parents will absolutely not regret. These were hand-picked, and analyzed for the best quality and durability for our babies. It is 100% BPA FREE, approved by FDA. 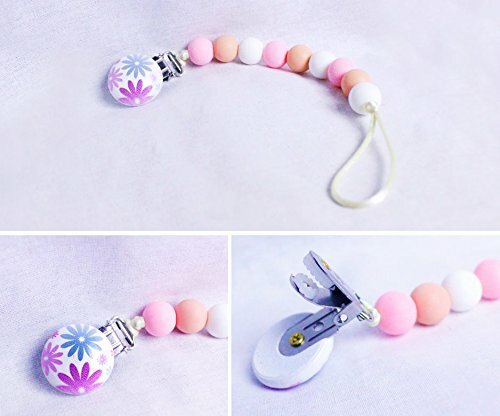 The teething beads are of good size, enough for the baby to grab on and chew. The clamp is sturdy and easily used to clip on and off, and the length is long enough to use but short enough to not become a choking hazard. The color schemes are MODERN SOFT PASTEL COLORS, attractive, and visually engaging. Our Joy Kit would not be complete without our travel easy, cotton pure canvas, double string bag. We believe in convenience for our parents, but not just convenience but sanitary and safe keeping. Stuff your baby’s teething items in the bag, close to seal and ready to go. The bag is small enough to stick into baby bags or book bags, but big enough to find and grab.